There’s no better way to sharpen your skills than to shoot in the 3D tournaments. Build confidence, distance judging, and overall shooting skills by participating in the ABA and your local tournaments. You don’t have to be a great marksman to join us for some fun and fellowship. If you would like to shoot and are not sure what to do, just ask the people at the registration table for help. They will get you paired up with an experienced shooter that will help you. View the rules to make sure that you are within the guidelines of the ABA. We want make sure that you have a great adventure in your bowhunting experience and most importantly, A Safe Bowhunting Experience. 6. Barebow - Bows without sighting aids or devices on the string, bow, glove or tab. No release aids or holding devices allowed. String silencers and overdraws are allowed. 7. 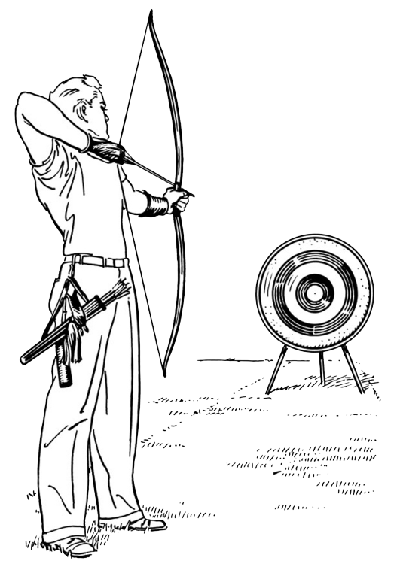 Longbow - Longbow without sighting aids or devices on the string, bow, glove or tab. No release aids or holding devices allowed. String silencers and overdraws allowed. 8. Recurve - Recurve bow without sighting aids or devices on the string, bow, glove or tab. No release aids or holding devices allowed. String silencers and overdraws allowed. 14. Youth (Unknown)- Consisting of all styles together in one division. 30yd Max +/-5yds. Ages 13-15. 15. Cub (Unknown)- Consisting of all styles together in one division. 20yd Max +/-5yds. Ages 9-12. 16. PeeWee (Unknown)- Consisting of all styles together in one division. 10yd Max +/-5yds. Ages 8 and under. II. Awards given will be determined by the Executive Committee prior to each shoot. III. Shooting will be from unknown distances except for "Known". Some part of the shooter body must touch the stake. IV. Scoring will be as follows 1st arrow-12,10,8,5. 2nd arrow-3-2-1. Only low 12's are in play. V. In order for any arrow to receive the higher scoring value it must at least touch the line. No one in the group may advance toward the target until all arrows are shot. VI. No crossbows allowed in any division. No range-finding devices shall be used in any division except "Known". (Binoculars are allowed in all divisions). VII. Participants must be current ABA members (Except during Scholarship Shoots). VIII. Only the Executive Committee can make changes to these rules. The committee has the final decision on all rules. Want your tournament to be listed in the schedule?